his year was going to be a special one covering the PDN PhotoPlus Expo + Conference in New York. The show is the largest photography and imaging show in North America and is attended by over 24,000 professional photographers and enthusiasts. With over 250 exhibits showcasing thousands of products, any photographer worth his salt will attend. This show gives me the opportunity to visit many industry friends and search for some of the hot products for our Best In Show review and videos. This year our plan changed and we have expanded our coverage and added new staff to cover this enormous show. Joining IPA recently is our new IMPress and IPA correspondent Andy Peeke. Andy is a popular spokesperson, model, actor and comedian and a great all around guy that I met at one of the previous shows I cover in New York. Andy was actually a spokesperson and model at that show and helped me out when I had difficulty with one of the companies. 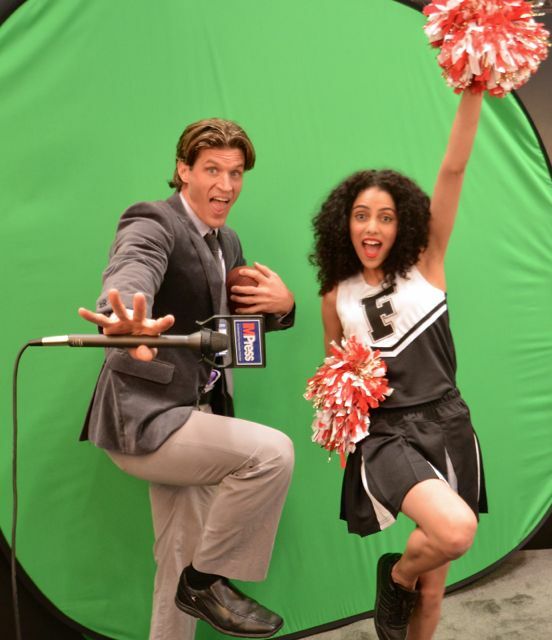 The spokesperson for the company wasn’t comfortable in front of the camera, until she met Andy. 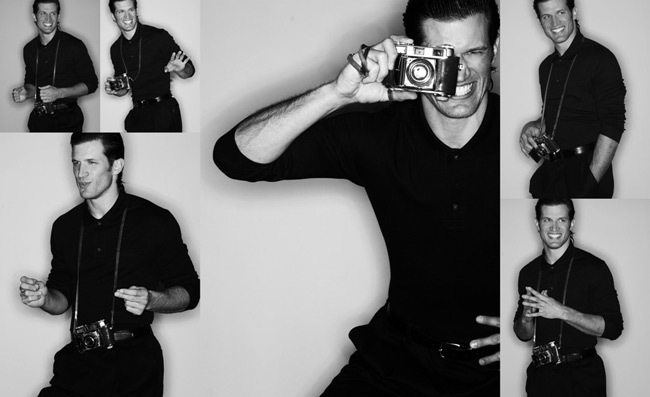 Once I recognized his talent, I knew we were destined to work together on future projects. PhotoPlus was our first major project together. Be sure to watch all the company videos we did, Andy is sure to entertain you. 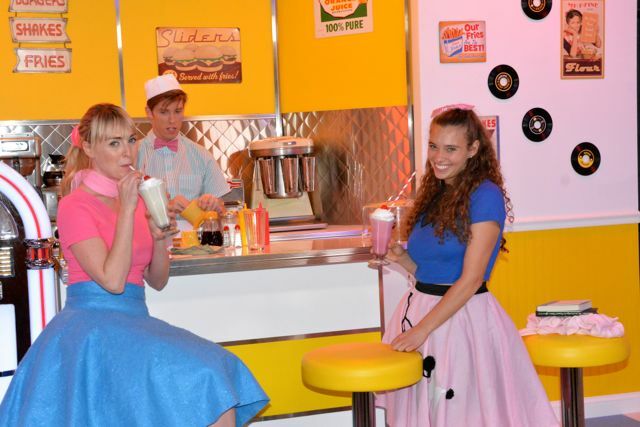 The show was held again this year at the Jacob Javits Convention Center and the exhibits ran from October 24th through the 26th and seemed more intense and electric than earlier shows. We found many new companies exhibiting at the show this year and some that have downsized their participation like Manfrotto the Vitec Group of companies and others. There were of course conferences at the show for attendees seeking to expand their knowledge. Frankly, we are so busy covering the exhibits that we never had an opportunity to sit in on these, but maybe one day we will. Once again this year, we found an increased interest in videography equipment for the DSLR photographer and welcomed the opportunity to talk to many for our show review. Three years ago I began the transition myself and with the help and support of companies like RODE mics, Beachtek Audio (click links to see our product reviews), Manfrotto, Tamron, I now had the tools I needed for my education and professional growth. You can review some of my earlier reviews to compare them to this one. It was my mission to help all of our IPA members and our fans understand the need to expand their knowledge and their potential market by adding this creative service to their business. At this show we found some great lighting companies entering the field and leaving some of the older LED light companies in the dust. You will see some of the hot new products from Rotoliight a UK-based company producing the best LED studio lights in the industry. You will hear how Hollywood has put their lights to use in the James Bond thriller Skyfall and how Tom Hanks in Capt. Phillips used their top of the line Anova lights in filming his movie. You will even hear Andy ask their president Rod Gammons a few questions including “which light would James Bond, Mick Jagger or Queen Elizabeth choose for their photo shoots” great stuff, you have to watch the video. Then we have F&V Lighting a company producing some fantastic on and off camera LED lights, that absolutely slaughter the competition in light output, design, function and of course price. Be sure to check them out as well. Once again all the major camera companies were there; Nikon, Canon, Sony, Olympus and Panasonic. Nikon had some great photo and video sets that gave videographers and photographers some wonderful photo and video ops. 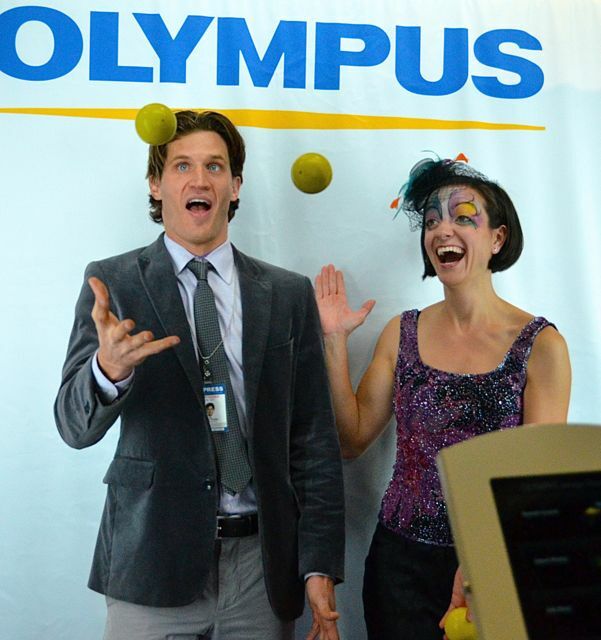 Olympus had acrobats, jugglers and other entertainers there as well. Andy had some fun juggling with their talented juggler at the show. The challenge for us covering this years show is to try to find companies that offer quality products that are innovative and useful. This year we decided to spend a great deal of time before the show, visiting many of the exhibitor websites to see exactly what they would be showing and then put them on our list. This list then enabled me to contact the companies in advance, make an appointment to visit them and if we were IMPressed would interview them for this article and videos. This year we came to the show prepared. 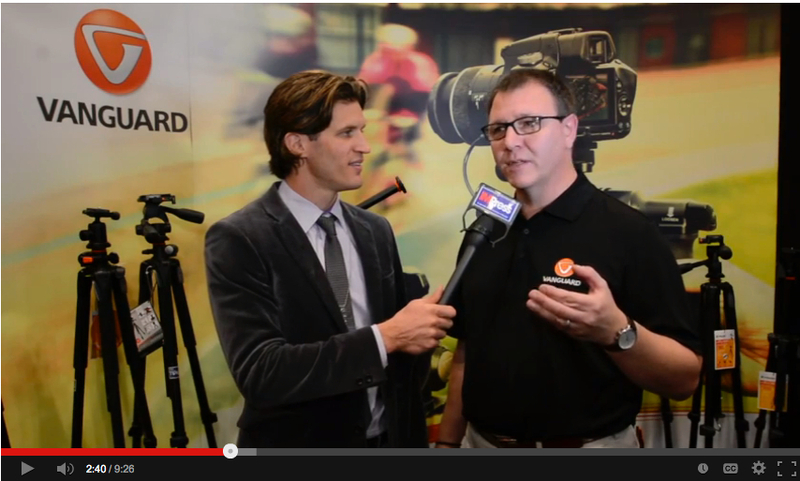 We added Andy Peeke to our staff, who makes our on camera interviews, smooth and more polished than in the past. I brought my assistant Alfredo Zuniga with me to take some of the heavy lifting off my back so we were able to move fast through the crowded aisles of the show. Not having to deal with the movement of our equipment or doing the interviews, made it much easier to create the fantastic videos we did for each of the companies selected. You see last year we did two show videos that only touched on their best products, this year we were able to go in-depth to the Best of Show companies and give them better coverage then would be possible in the past. That means fewer words in this article and more videos to show you the equipment and how they function. So with our list in hand, we set up off the Press Room to have Andy do his intro and announce six of our picks for Best of Show. They were, Tamron, Datacolor, Vanguard USA, Phottix, Cokin, Hyper and on the second day we added Rotolight and F&V. We had our core of six companies and hit the floor to locate some others. We have been searching for quite some time to find quality and affordable LED lighting. 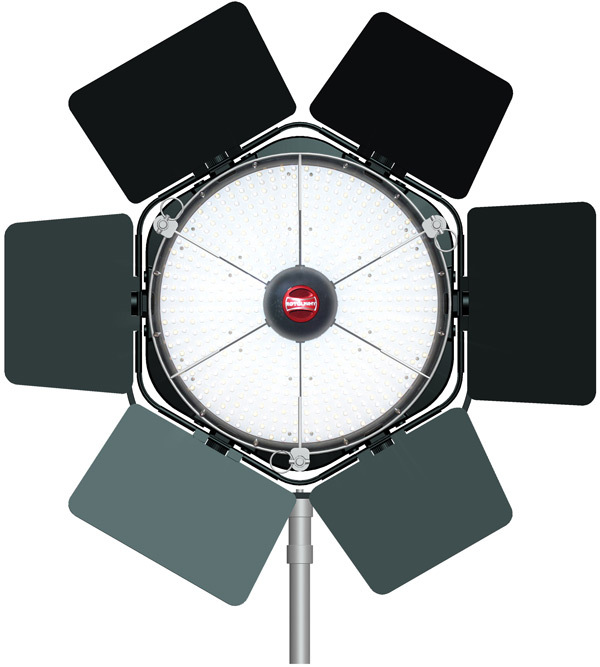 We had tried using some of the Litepanel products, but unfortunately, we didn’t have much luck with their Croma or other lights and they didn’t seem to compare to some of the new products from F&V and Rotolight. You can see some of these company lights that we used to shoot their segments in the videos. 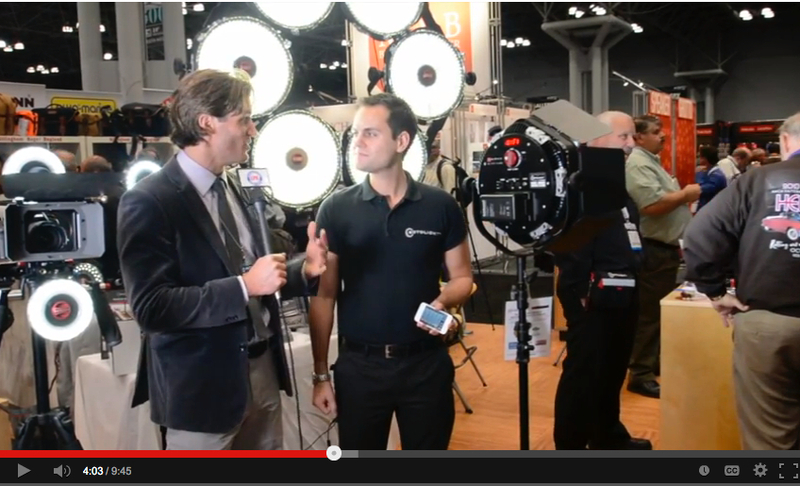 The show stopper for us was Rotolight. You may not realize that some of the top movies you have seen are using this companies lights. We fell in love with their ANOVA and working hard to get one to test, use and do a product review. Over the two days we attended the show, we had the opportunity to meet John McGeary the PDN Managing Director. John was gracious enough to arrange for an on-camera interview which we did at the end of our second day at the show. As you will learn from his interview this show is the best of its kind with over 20,000 photographers attending and over 400 members of the media. For those of us looking for Holiday gifts, this show is a wonderful place to find those items we all want under our Christmas tree or next to our Hanukah candles this year. I have already arranged for mine…new ultra slim filters from Cokin, check, the new R-300 and Z180 on camera lights from F&V,check, the Anova from Rotolight and some other goodies that we have reviewed in this article, not checked yet, but hopefully will be soon. Unlike previous show reviews and videos, this year we decided to give our readers a closer look at each of the companies and their products. 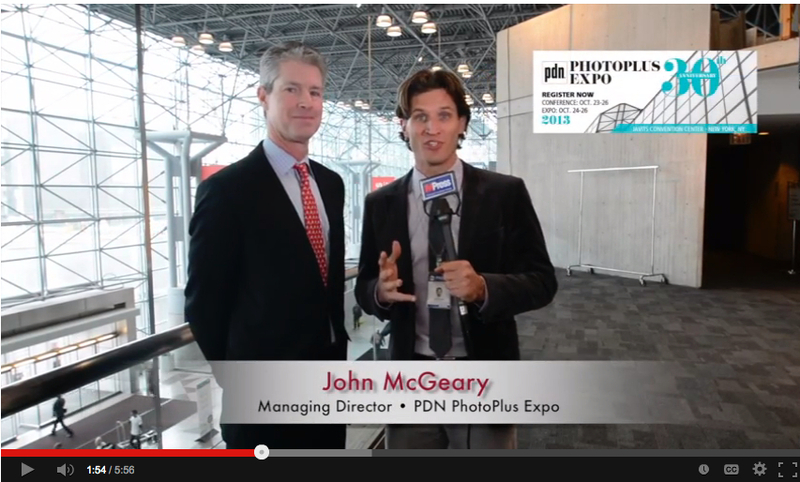 We have decided to present our opening show video with our interview with John McGeary the PDN PhotoPlus Show Managing Director. You will have a peek at the show floor in the video and get an idea of why you must be at next years show. One of our favorite companies. 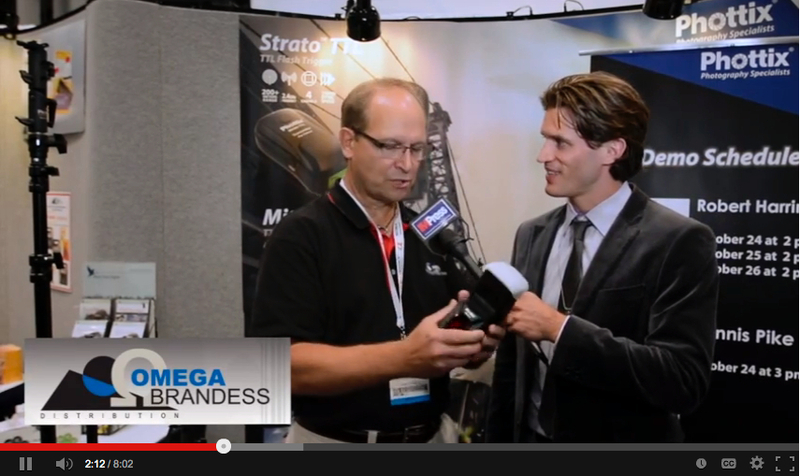 OmegaBrandess is one of the countries largest distributor with over 70 product lines. We know that they always have something new for us to discover, so they are our first stop at the show. 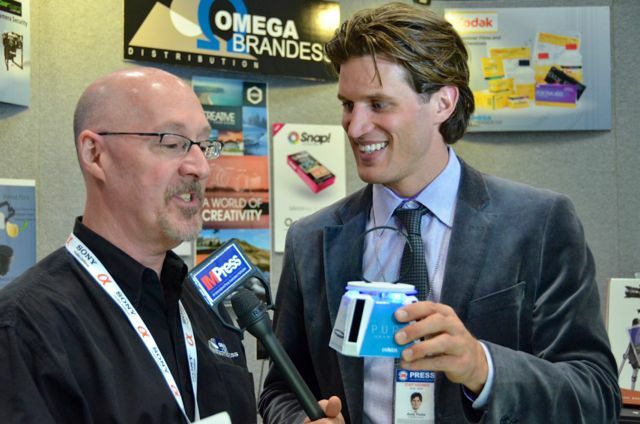 Jeff Seidel, OmegaBrandess director of sales helped me select some of their hottest new products from their best product lines. 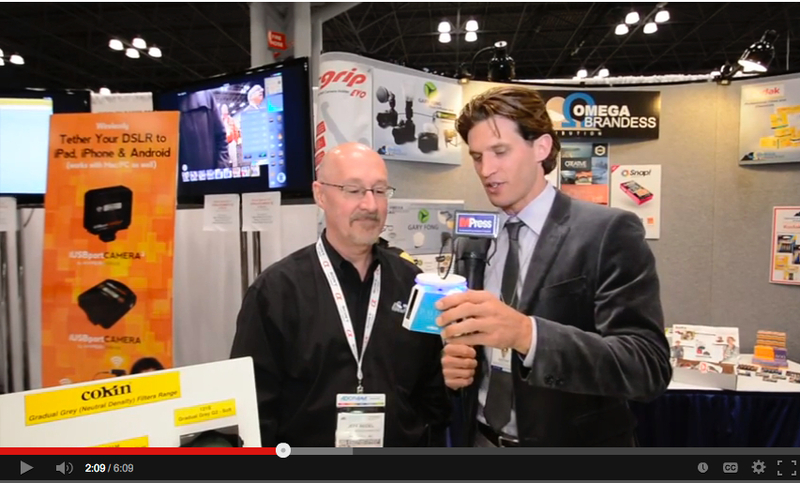 In our video you will see some great products from Cokin, Phottix, and Hyper . To watch their videos click on the link under each screen shot. Watch Jeff and his team, go through our Best Of Show picks and also introduce some other hot products from these companies. We had selected three companies from Omega Satters list that deserved to be part of this project. Two of them we included in last years review and had to once again include them this year. You will see new products from Phottix and a review of Cokin’s Pure Harmonie filters too. Cokin is known for their “Creative Filter System”. Introduced in 1978 and based primarily around square filters, these need a holder which is attached to the lens via a simple adapter ring of the proper size. 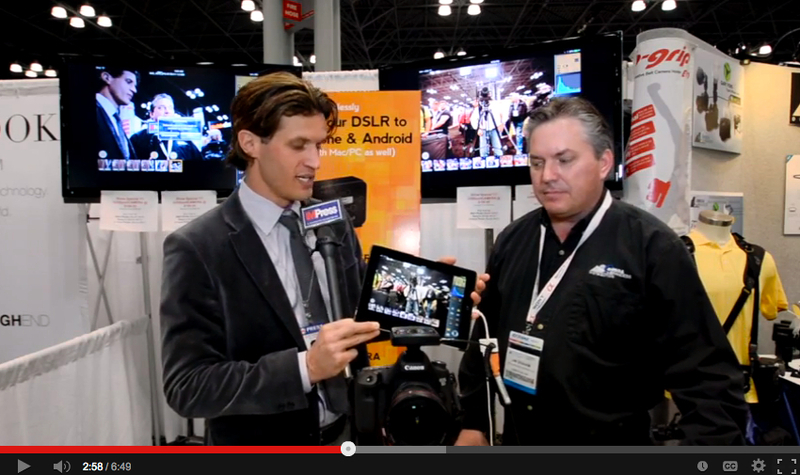 DSLR videographers are finding the system invaluable too. Unlike screw-thread circular filters, which are each tied to lenses of a specific diameter, those in the system can be used with any lens, provided they are large enough to cover it sufficiently. “Pure Harmonie filters” Cokin now offers their world-class round filters, which are screwed into each of the appropriate size on the lens. “PURE harmonie filters” are characterized by their extremely lightweight and its small thickness. They are being offered in a UV filter, a circular polarizing filter and an ND filter. I am proud to own their UV and circular polarizing filters and shot all of our videos with my very sleek and slim UV filters on my Tamron lenses. Visit their website to learn more…. We will look to review their iUSB port camera in the future, something that would be very handy for us when shooting these assignments, truly amazing. Watch for it soon. See our Hyper video for a look at their hottest items. Visit their website for more information. From their website… “Tamron is a global manufacturer of optical equipment that offers premium-quality products for many different industries. ” What it doesn’t say is that Tamron is the largest manufactuer of lenses in the world. Yes, the largest and they produce some of the most innovative lenses. They offer a wide assortment of focal lengths for full-frame and APS-C digital SLR (DSLR) cameras and Sony mirrorless interchangeable lens cameras. They also supply lenses to industrial customers like CCTV lenses and Panorama Cameras, and ultra-high precision lens elements, to its OEM products for other manufacturers. 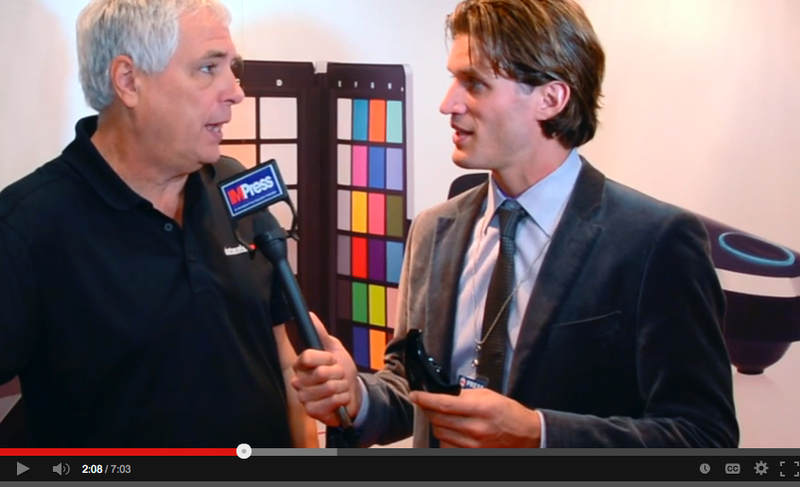 Datacolor is a global leader in color management solutions and color communication technology. The world’s leading brands, manufacturers, creative professionals and consumers, have been choosing Datacolor’s innovative technology and solutions to consistently achieve the right color for over 40 years. All serious photographers, videographers and graphic professionals know and use Datacolor Spyder4 and other color calibration tools to adjust color shifts in their monitors over time. We use and reviewed their Spyder4Pro and you can watch our video on how to use it. There is much more to this company and their products visit their website to learn more. We were anxious to visit Doug Feldner now at Vanguard to see their product lines. For 26 years, VANGUARD has been a global leader in high-quality photo-video accessories (tripods, monopods, ball heads, camera bags and cases). They also manufacture hunting accessories (archery bow cases, gun cases and gun pods/shooting sticks) and sporting optics (binoculars and spotting scopes). Their diverse lineup includes products with first-of-their-kind . 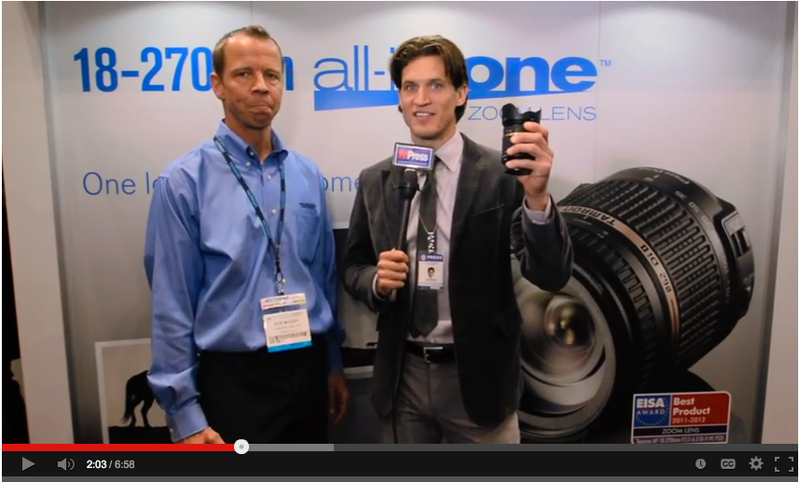 We found their Abeo Pro 283CGH tripod our Best of Show pick. We loved this pods ability to allow us to shoot from any angle and from the ground too, perfect for our macro and video work. Rotolight is a relatively new company in our industry and produces their lights at the Pinewood Studios in the U.K. As any James Bond fan knows this is the same studio where many of the bond films were made. Their incredible LED lights are made for the film and photo studios and the cinematographer, including those producing some of the hottest movies like Skyfall, Captain Phillips and others, love working with these lights. This award winning company has won so many awards that our Best of Show just adds one more notch on their belt. We loved their energy-efficient and beautifully designed Anova lights that produce 1,000 watts of equivalent tungsten light and draws 39 watts of actual power. This means no power outages, small relatively inexpensive batteries when on the go and the ability to light a set better than any other LED product we have seen. These lights can be daisy chained as you will see in the video and are the most ingenious products that can be controlled with an iPhone or iPad. We can’t say enough about this company and their products and urge you to watch our video featuring Rod Gammons one of the youngest and brightest photo company presidents we have met. You will be impressed, I can assure you. 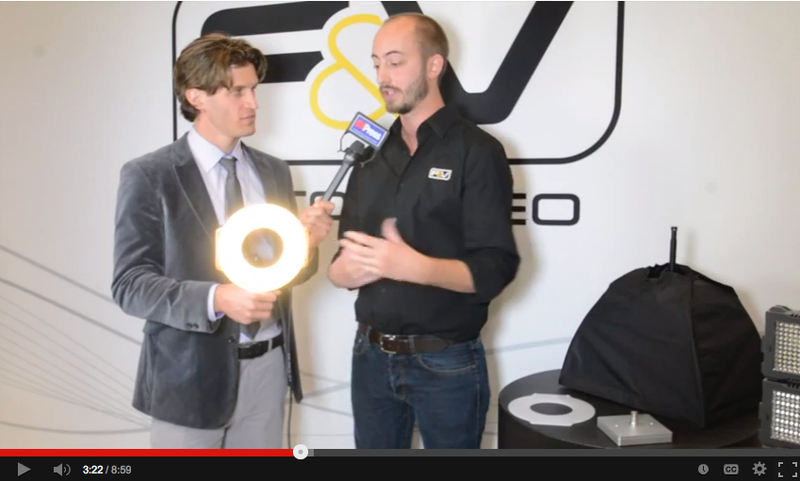 F&V boasts the broadest offering of LED lights. While their product lines span many price points to meet the needs of different end users, the quality of their products remain high. This company has some of the finest on camera lights we have seen, including some from the biggest names in our market. They have invested heavily in applying the advancements of LED technology for both photo and video applications. We have selected them Best of Show for their innovative design on their Z180S a bi-color on or off camera video light that can be stacked with other units to virtually create a wall of lights. All stacked lights can be controlled by one light. A product that is a must have for any photographer or videographer. We are looking for four units for our show rig that will enable us to travel light and build the lighting we need on site. I would be remiss if I didn’t thank all the people and companies that have supported our efforts over the years. This was a big undertaking and without the cooperation of all the people you see in these videos and those behind the scenes it couldn’t be done. So without naming everyone, you know who you are, my thanks for your continued support of our mission to help our members to Learn By Doing. If you don’t get out and do the work, better your skills and publish your works, you can never reap the benefits. Our IPA members have learned this important lesson. I love to share my equipment list with our members and our fans, so here is the bulk of what we used to produce this project. Teleprompter – Home Made using an iPad teleprompter app. Mac 2012 27″ desktop with 32 GB of Ram and 4 External 4 TB Seagate hard drives.